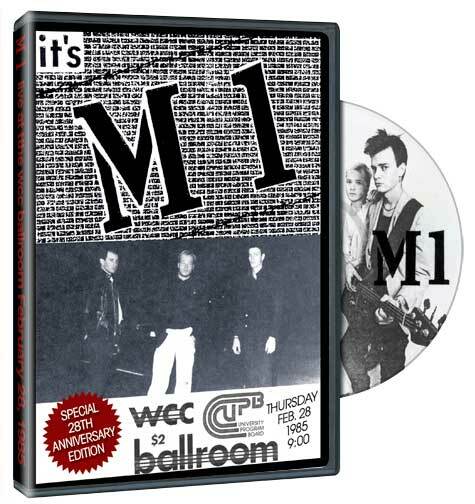 M-1 was a power trio based at James Madison University in the 1984-1985 school year. Playing all original material from punk to new-wave to ska, the band featured Nick Stewart on Bass and vocals, Mr. X on Guitar and vocals and Trevor Speed on Drums and vocals. M-1 played all of the Shenandoah Valley hotspots including, the Mystic Den, Calhoun’s, The Little Grill, and of the course the WCC Ballroom. A Fan ripped the file and even made a facebook page! This 2 set show on the JMU campus also featured the Bernstein Brothers; Chuck Cohen and Jim Feeney. Before The Absolution, Habeus Corpus, The Bodies, Trust, Fear of Man, Little Debbie and Meat Department, there was M-1. And then there wasn’t. The concert from 1985 has been remastered, unmixed and is now available in limited numbers. To order copy of the DVD for $10 postpaid, through paypal, click on the button below.